■ Where to vote—including a customized ballot with all the decisions you’ll face. ■ Every item on your ballot, explained: BallotReady and Ballotpedia. ■ What to do if you’re turned away at the polls. ■ Need time off from work to vote? You may have it coming. ■ Interactive surveys from the Tribune and WBEZ help identify which candidates you agree with most. ■ Endorsements by the Tribune and the Sun-Times. ■ The Trib’s profiles of the mayoral candidates and answers to its questionnaires from the candidates for mayor, alderman, and clerk and treasurer. ■ Mayoral candidates’ answers to questions from WBEZ, Crain’s and the Reader. ■ Highlights of their ethics reform plans. ■ WBEZ’s voter crib sheet. ■ Chalkbeat surveys the candidates’ education policies. ■ The Triibe reviews black aldermen’s voting histories and where their campaign dollars are coming from. This is an evolving document. Want to recommend a link? 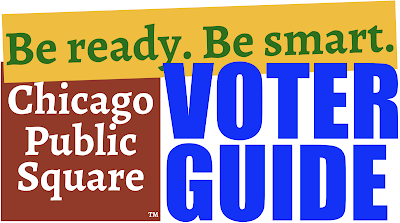 Email Vote@ChicagoPublicSquare.com. Be informed for every election. Sign up for Chicago Public Square email, sent to your inbox (free!) weekday mornings at 10. And if you find this useful, please share it and please help Square grow with your pledge.